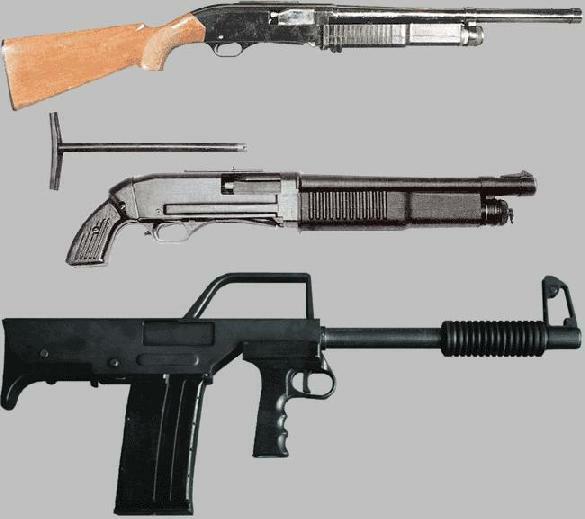 FROM TOP TO BOTTOM: KS-23 STANDARD MODEL, KS-23M MODEL WITH SHORT BARREL AND REMOVABLE STOCK, KS-23K BULL-PUP PUMP-ACTION MODEL The barrels of these toys are made out of the barrels of discarded/whitdrawn from service 23mm aircraft cannons. The main use of the KS-23 is anti-runaway-vehicles and anti-barricades, and this is done by using 23mm shells that are HIGH-EXPLOSIVE. The ammo normally used in the KS-23 to defeat vehicle engines or to breach through barricades and/or armored doors is something that I can only ressemble to the grenades fired by the M41-A pulse rifle of the Colonial Marines in the movie "Aliens". The Russians themselves cannot decide whether call the KS-23 a "large combat shotgun" or a "hand-held small-caliber grenade launcher": the 23mm shell of the KS-23 is more similar to a grenade, in dimensions, engineering and effects, than to a standard shotgun shell. The cartridges are so big that the KS-23, even if it's large a bit in its standard versions, holds no more than 4 rounds; only difference is the KS23-K, the bull-pup of the series, which is pump-action (all others are semi-auto) and holds 6 shells.